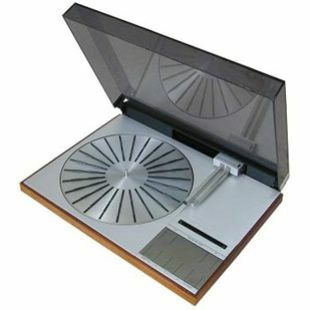 This deck was a variant of the Beogram 4002 but fitted as standard with a CD4 decoder. As with the 4002, there were two clear models , the earlier with the AC motor and the later with a DC motor. The DIN plug was unusual in that it carried 4 discrete channels and was therefore best suited to the Beomaster 6000 or 3400. It did have a built in RIAA though and would play stereo records perfectly happily as the rear channels could be switched off. The cartridge specified was the MMC6000, the ultimate cartridge in the range designed by and bearing the name of one of B&O's pre-eminent engineers, Subir Pramanik. Speeds	33 - 45 rpm.